Good day to finish this project - after the gold medal for Canada in Olympic curling and the win to secure a spot in the gold medal game in men's hockey. Here is the project that Wendy wanted me to complete for a very long time. 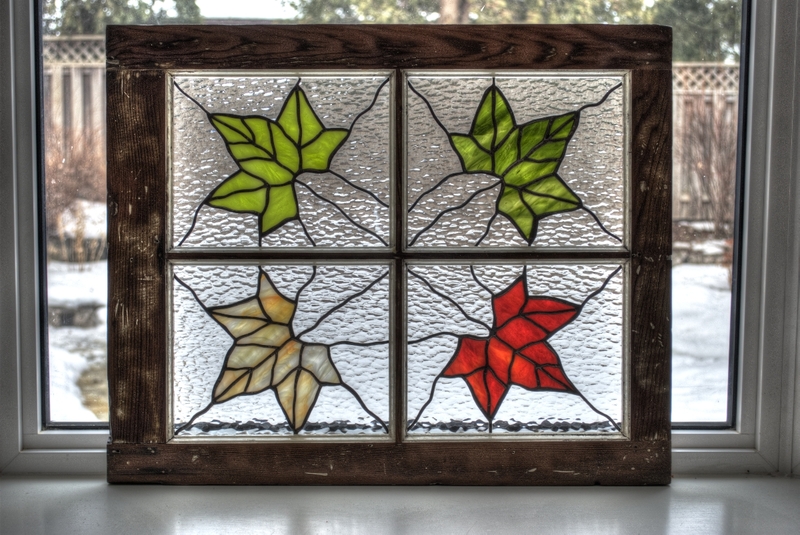 We had the idea to make this while we were preparing for Iceland (while doing stained glass events), but it took this long to get it done. The leaves were cut out almost a year ago and they just sat around in baggies waiting until I worked on them. Last week I got some clear rippled glass and cut all the background pieces. Our friend Carolyn (whose birthday is tomorrow...) gave us the old window frame. Wendy cleaned it up, sanded it, and I put a clear satin finish on it. We are going to hang it in the window by a chain, but will hopefully get to that soon (yeah, we've heard that before!). I think it will look nice at any time of the year.